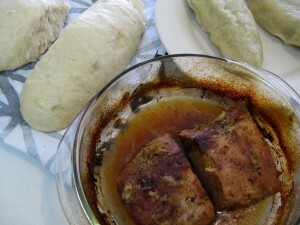 If you are familiar with Slovak or Czech cuisine, you surely know that one of the most unique features of our cuisine is knedľa, large bread-like dumpling that is served with main dishes. It goes really well with stews – such as segedin goulash or goulash with dumplings. 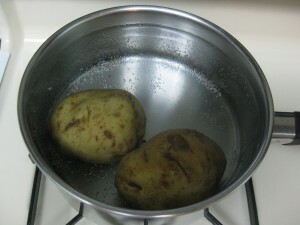 Cook the potatoes (zemiaky) with their skin still on in salted water until they are soft. This will take about 30 minutes. Also put a big pot of salted water onto the stove once the potatoes are done. 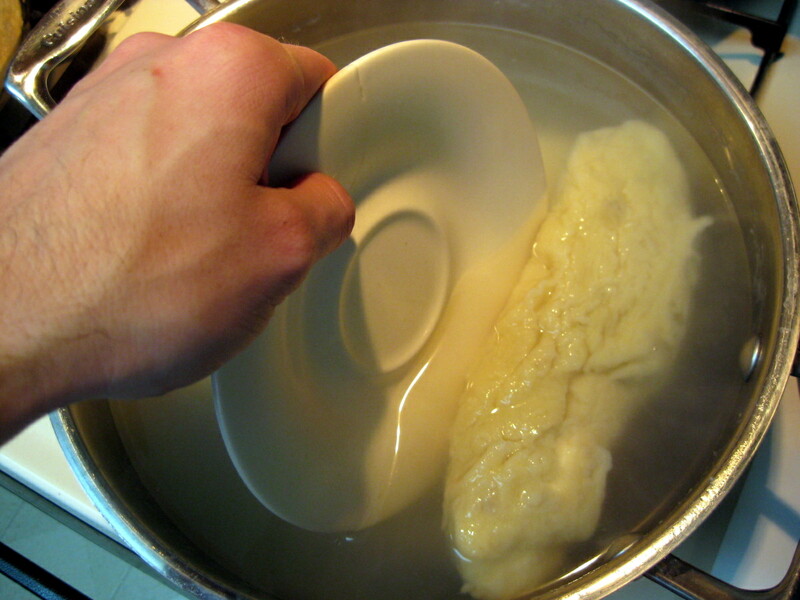 Bring to boil while making the dumplings. 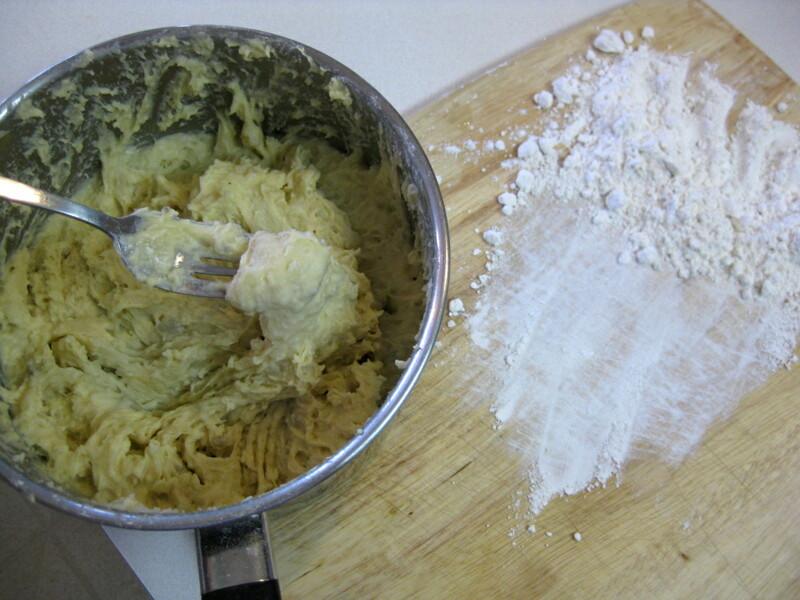 Next dust a rolling board with flour and also use some flour to coat the dough so you can handle it. Divide the dough into two section. Roll each into a long cylindrical dumpling. 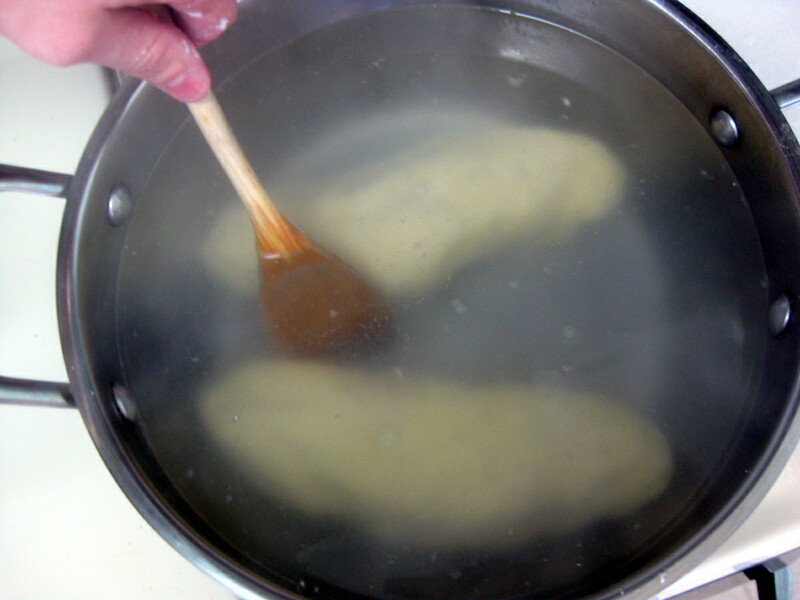 Carefully move the dumplings into the boiling water from step 1. They’ll probably stick to the bottom, so use a wooden spoon or a spatula to unstick them. Cover the pot and cook for about 12 minutes. Then to remove them, what I found to work great is two coffee cup plates. 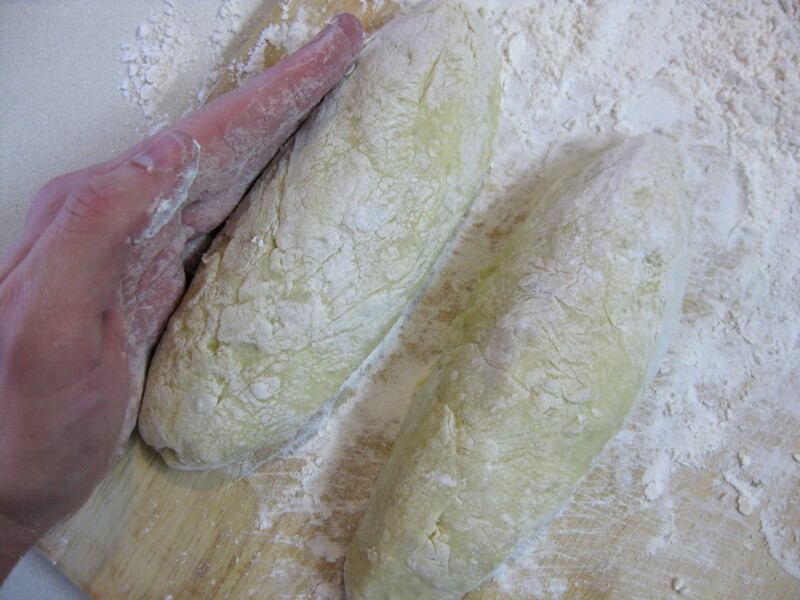 Hold one on each side of the dumpling and lift it up. Just be careful when doing this as some of the hot water will remain on the plate. 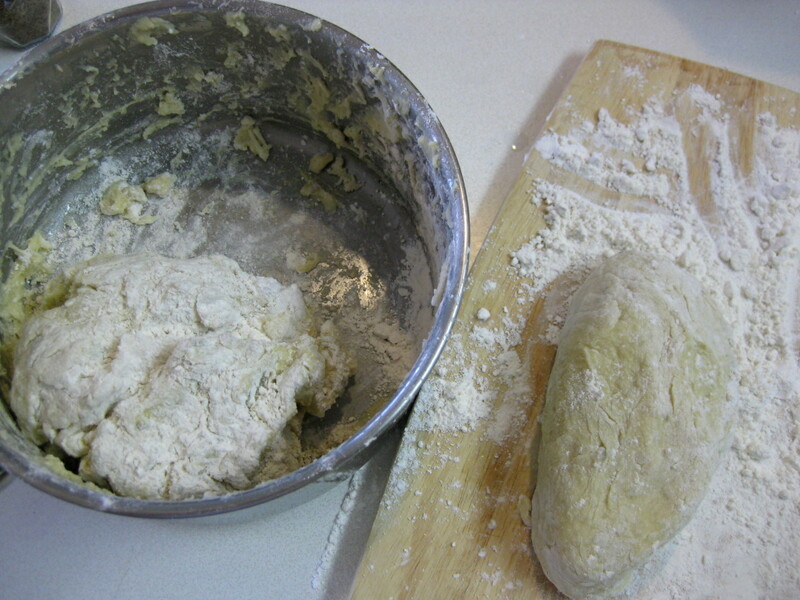 Place the dumplings onto a plate. Let them dry for few minutes and then rotate both dumplings upside down so the bottom side gets dry as well. To serve, cut out slices quarter to half-inch thick with a knife or using a thread. And here is how the dumplings look: regular knedľa on the left and the potato one on the right. I’ve had these before with Czechs! They are great with goulash. I tried this one, it was great, thanks for sharing! Maybe you can try using a cheese cloth to prevent them sticking to the bottom of the pot, as well as to be able to take them out easier. My mom made these, only after she made the log form she cut with a knife “the dumplings” ( about 1 1/2 inches) into pieces before putting them into the boiling salted water. 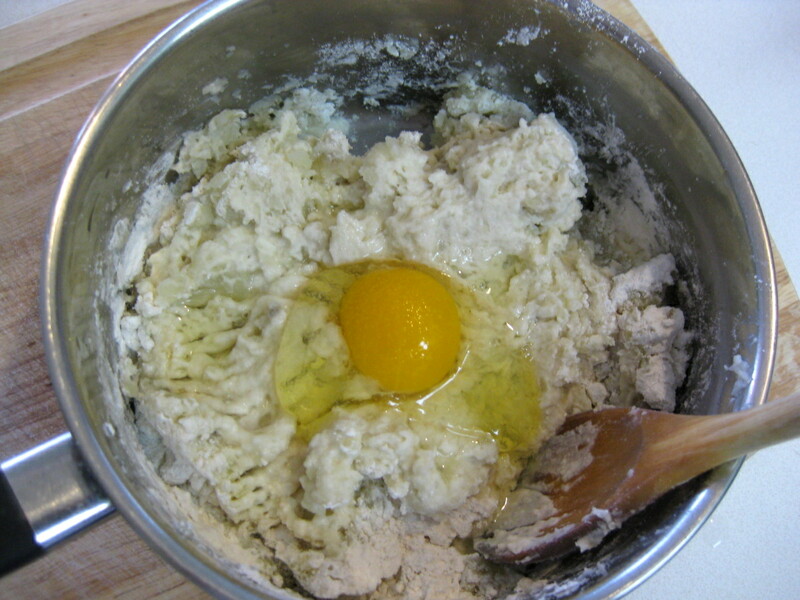 When done cooking she carefully removed the dumplings with a slotted spoon. Then to eat the dumplings we put on butter. Also we had hot plum dumplings,,the regular dumpling was rolled and then cut into squares, plum and abt 1 T sugar and dot of butter in the center, then the dumpling sides folded upward over the plum and pinched the edges together, and a awesome dessert like treat. Michael muze byt polohruba , semolina a Wondra , kterou dostanes ve vetsine obchodu . Wondra je v modre krabici a nevim v kterem state bydlis tak nemohu poradit kde nakupovat Wondru a Semolinu . Najdi si recepty na allrecipes.com na bramborove knedliky .